Let’s have a list of dates or some kind of calendar. We want to highlight first Mondays or Tuesdays or Wednesdays etc. in each month. 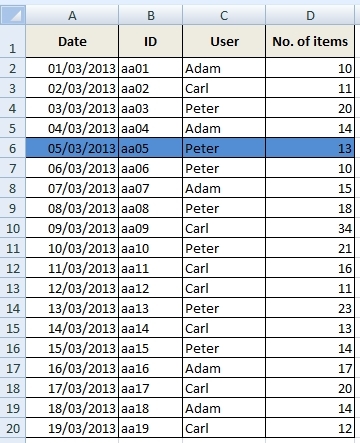 The example shows how to use conditional formatting to solve this task. Select cells with dates and go to Conditional Formatting >> New Rule… >> Use a formula to determine which cells to format. Now write the formula and choose Format. 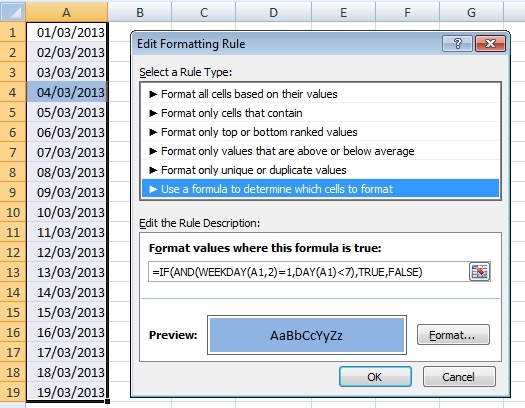 Note: You can also select only one cell and copy conditional formatting from it to other cells (using Format Painter). Note that the formulas differ in only one number. Now we do small modifications in conditional formatting formula to highlight row and column. Place the $ character is very important. There are the examples for Monday. Other days are similar, just change number in formula like before. This video shows how to set conditional formatting for highlighting the row of table. How to choose first monday of month by conditional formatting. Nice solution. This Excel function saved my time. Thank you. Is there link to download this solution in Excel format?